How I Met Your Mother fans may feel a little tense, and for good reason. We’ve waited through nine seasons of stories, laughs, tears, and weddings. Through that time, it took until the season eight finale to finally meet the title character. Even then, we only got a quick peek at the Mother. So, the producers decided to finally let us know that they feel our pain. At San-Diego Comic Con last weekend, we got the first promo for season nine, featuring Ted’s kids! We forget that they’ve been sitting on that couch for nine seasons, waiting to hear how Ted met their mom. The kids, played by Lyndsy Fonseca and David Henrie, haven’t even gotten a bathroom break. They’ve been sitting, listening to the horribly long and detailed story. 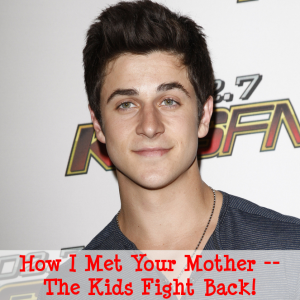 David Henrie said he went through puberty on that couch. Fonseca complained that she didn’t get to go to college. They’ve been surviving off of rainwater and a spider farm they made in a World’s Greatest Dad mug. The final season of How I Met Your Mother will debut September 23 2013. The entire season will take place at Barney and Robin’s wedding, including the final slap in the slap bet between Marshall and Barney and the last Robin Sparkles song.